...And Sewing Is Half The Battle! 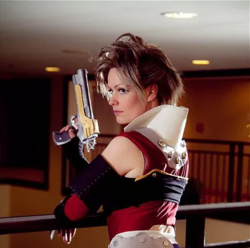 Alena has been cosplaying for 15 years, and has provided professional costuming and SFX makeup work for film, television, live theatre, and museums. An entirely self-taught seamstress, Alena loves helping novice cosplayers improve their craft through workshops and costuming seminars. She is one-third of competitive cosplay team "And Sewing Is Half The Battle! ", an Indiana-based group that has garnered more than 40 awards for their costumes and performances at events around the country. When she's not in costume, Alena juggles the hats of writer, actress, animal trainer, gamer, and fangirl.